Devil Pig : Forum » Call for votes on BGG! 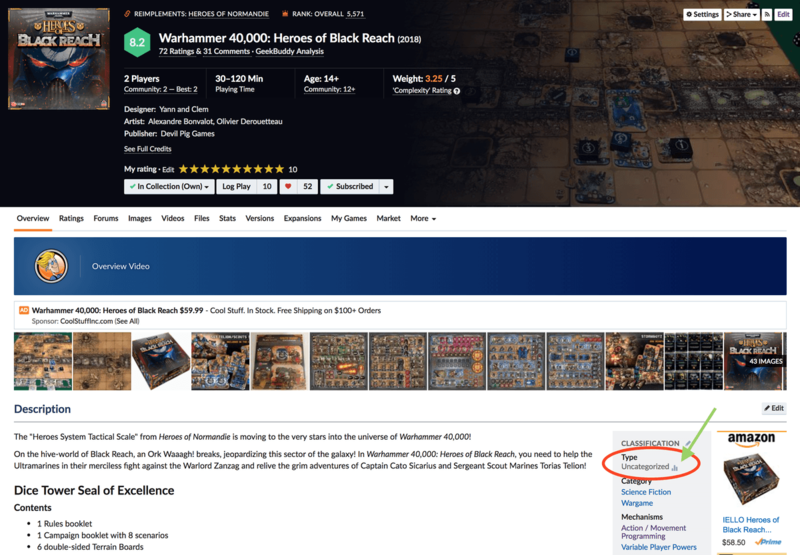 Forum » [English] WH40K Heroes of Black Reach » Heroes of Black Reach » Call for votes on BGG! Call for votes on BGG! 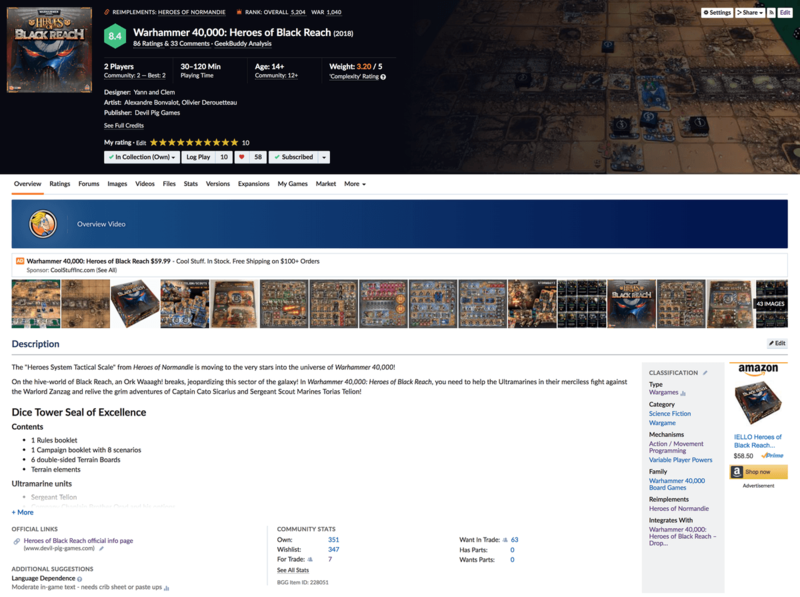 Many of you are also users on BoardGameGeek. Recently, Heroes of Black Reach got a very favourable review from Sam Healey of the Dice Tower with a Seal of Excellence. 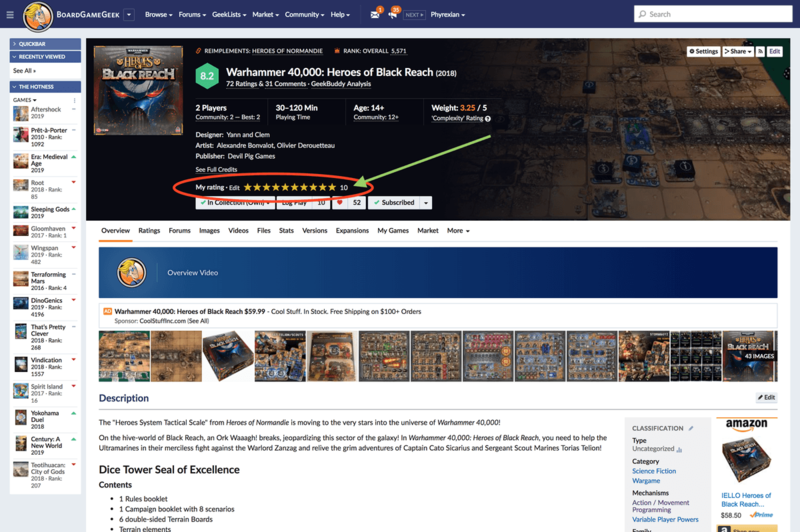 BGG ratings help sales, so a good rating on BGG is a really good thing. At the moment HoBR has very few ratings (72) and is sitting at position 5,571. HoN, in comparison, sits at position 781. So, if you have some spare time, go and rate HoBR at BGG. It's very easy. After rating for general scoring, could you also categorise the game as a 'war game'? At the moment the category rating is inactive as a result of too little votes. Again, this is also very easy. Thanks to this category label, HoN sits at position 112 in the War Game category. Which is very high, considering there are over 9000 war games in the BGG database. But I agree, it helps for sure to let others know. It's BGG… There are people who cannot stand other people liking something. What was also sad is he does not even say why. At least others have given reasons for their scores. The twit who gave it a 1 didn't even give a reason. As with all other HSTS games, it is rated a 10 by me. I rated it 9. Just because the 10 rating attracts the 1 rating trolling. After rating for general scoring, could you also categorise the game as a 'war game'? At the moment the category rating is inactive as a result of too little votes. Just curious, do we know how many ratings does it take to show the category? The downvoting is indeed completely rediculous. Who rates game at 1 anyhow? It’s also useless because the BGG rating algorithm takes into account the really high and really low ratings to calculate some deviation. I have no idea how many votes we need before the ‘war’ category shows up. We're up a few spots! Good start. Now we just need to keep going.